If in your WCSF solution you use Web Application Project (as opposed to Web Site Project) for your web site you are able to use a so called sub-Web Application Project in order to further modularize your web application. If you created a WAP WCSF solution from scratch this option will be available to your all right. 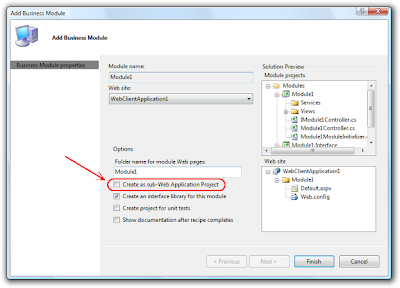 However if you converted your Web Site WCSF solution to WAP WCSF solution or upgraded from the previous version of WCSF this option may not appear when you are trying to add a new business module to your solution. Usually this section is located in the bottom of a .sln file and the red line is the key to solving the problem. If you don't see the line in your solution file simply add it and reload the solution in Visual Studio. Problem solved.